is a digital media artist living in New York City. She is currently an Associate Professor of Film and Media at Hunter College. Polli’s projects often bring together artists and scientists from various disciplines. She is interested in global systems, the real time interconnectivity of these systems, and the effect of these systems on individuals. She has exhibited, performed, and lectured nationally and internationally. She currently works in collaboration with atmospheric scientists to develop systems for understanding storm and climate information through sound (a process called sonification). Recent collaborations include: Atmospherics/Weather Works, a spatialized sonification of highly detailed models of storms that devastated the New York area; Heat and the Heartbeat of the City, a series of sonifications of actual and projected climate in Central Park, the heart of New York City and one of the world’s first locations for climate monitoring; and N., a real-time multi-channel sonification and visualization of weather in the Arctic. 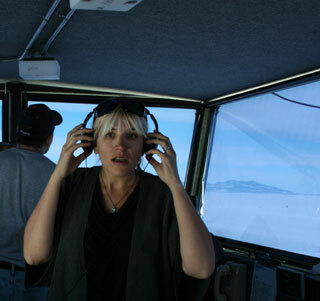 She recently spent seven weeks in Antarctica on a National Science Foundation funded project, see 90degreessouth.org. For this and related work, she has been recognized by the UNESCO Digital Arts Award 2003 and has presented work in the 2004 Ogaki Biennale in Gifu, Japan and at the World Summit on the Information Society in Geneva, Switzerland. Her work in this area has also been presented at Cybersonica at the ICA in London and awarded funding from the New York City Department of Cultural Affairs and the Greenwall Foundation. As a member of the steering committee for New York 2050, a wide-reaching project envisioning the future of the New York City region, she is currently working with city planners, environmental scientists, historians and other experts to look at the impact of climate on the future of human life both locally and globally. She has recently presented the installation and digital print project The Fly’s Eye, (2002) which creates a live movement and light analysis and deconstruction of the video image, at Le Centre de production DAÏMÕN in Quebec, the Politecnico di Milano University in Milan, Italy, at The Kunstgewerbe Museum in Berlin, Germany, at The Aronoff Center in Cincinnati, OH, at Apex Gallery in New York City, at the V Salón y Coloquio Internacional de Arte Digital in Havana, Cuba, and at SIGGRAPH ’03 in San Diego among other venues. Polli’s longest running performance project, Intuitive Ocusonics, a system for performing sound using eye movements, began in 1996 and has been shown at V2 in Rotterdam, Holland; at the N-Space Art Gallery of SIGGRAPH ’01 in Los Angeles, CA; at the Subtle Technologies Conference at the University of Toronto, Canada; and at Immedia, at the University of Michigan. Other performances and presentations include: The Monaco Danses Dances Forum, Monaco; ISEA, International Symposium on Electronic Art, Paris France; Invencao, Sao Paolo; and Imagina 98, Monaco. To support this work and the production of an Audio CD, Active Vision, she was awarded a 1999 artist’s residency at The iEAR Institute at Rensellaer Polytechnic, a Harvestworks Recording Production Grant in New York, an Artist’s Residency at The Center for Research in the Computing Arts at The University of California at San Diego, and a residency at Franklin Furnace in New York as part of The Future of the Present. She has also shown this work in venues throughout New York City, Chicago and the Midwest; in San Francisco, and in Finland, Iceland, Germany, Sweden, Greece, and the Philippines. Her performance work and research is documented in the article Active Vision in the October 1999 issue of The Leonardo Journaland a retrospective article about her work from 1991-1998, Virtual Space and the Construction of Memory, is published in the Spring 98 issue of The Leonardo Journal. Andrea Polli is an Associate Professor of Film and Media at Hunter. She is also director of the CUNYcolab Center, located in the Department of Film and Media Studies at Hunter College, a project she co-authored to bridge CUNY campuses and departments working in media. From 2005-2008 she served as the Director of the Integrated Media Arts Masters of Fine Arts Program. She is currently co-chair of the Leonardo Education Forum, an affiliate of the MIT Press and the College Art Association of America (CAA) that promotes the advancement of research and academic scholarship at the intersections of art, science, and technology, and is a founding member and co-chair of the New York Society for Acoustic Ecology (NYSAE), a chapter of the American and World Forums for Acoustic Ecology. She has served on review and curatorial boards for SIGGRAPH, The Lower Manhattan Cultural Council, the Electronic Music Foundation and others and received a Master of Fine Arts in Time Arts from the School of the Art Institute of Chicago.